The U.S. Food and Drug Administration is proposing a policy that could prevent manufacturers from selling dangerous metal-on-metal hip implants, according to a story in the New York Times. The story says all-metal hips – which have both a ball and a socket coated with a combination of cobalt and chromium – have been plagued by high early failure rates. 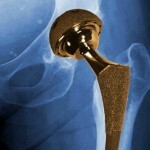 Traditional hip implants made with plastic or ceramic typically last 15 years or more. But Johnson & Johnson recalled a line of the implants by subsidiary DePuy Orthopaedics in 2010, after studies found nearly half of them failed within six years. The FDA proposal would require all-metal implant manufacturers to prove the devices were safe and effective, or they would not be able to continue selling existing models or get approval for new ones. That measure would close a loophole in federal law dating to 1976, which allows the devices to be sold without clinical testing as long as the manufacturers demonstrate they’re similar to devices that have already been approved.